When my daughter was born she developed severe respiratory issues and ultimately severe asthma. My husband and I immediately made the decision to remove all potentially harmful chemical laden cleaning products from our home and have never looked back. Over the years, we have tried a variety of natural cleaning products and I am excited to introduce you to a company whose products have blown me away in terms of effectiveness and affordability…..Unique Natural Products! Unique is proudly all natural so it is safe around children and pets and it uses a “unique” combination of bacteria and enzymes which makes it much more effective than enzymes alone. I am very impressed with the three products that I am using i.e. 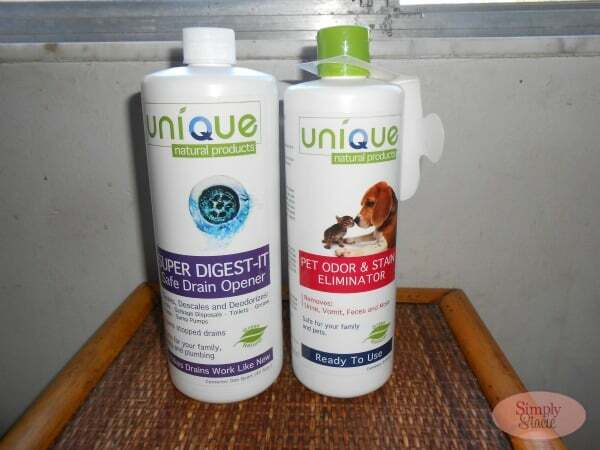 Super Digest-It Drain Opener, Wine Stain Eater and Carpet Shampoo + Stain Remover. “Mommy….the shower won’t drain the water!” The dreaded plugged drain again…my nemesis. I decided to put the Super Digest-It Safe Drain Opener to the test. This product states that it “cleans, descales and deodorizes” and I am pleased to report that it does the job. I plugged the drain and filled half way with warm water as directed. One cup of water was poured into the water and I let it sit for 30 minutes. Then I drained it and didn’t use the shower again until morning (recommended to sit for 6 hours). Water was draining as normal after one use of this product! We have found other great uses too i.e. in our garbage disposal, descaling our toilet and to flush the air conditioning line. This product is available for purchase for only $12.95 for the 32 ounce concentrate bottle. My next purchase will be the one gallon size (SRP $42.95). As much as I had hoped not to need the Wine Stain Eater, of course I inevitably spilled red wine on my living room carpet. This product is a must-have and a bargain at only $4.25. In addition to removing wine stains it can be on so many other stains to from coffee, tea or fruit juice (organic based stains). I applied the product directly to the spot and followed the directions i.e. placed a warm white rag over the area and by morning it was gone! 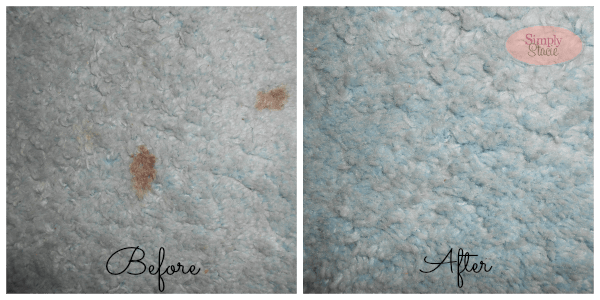 The Carpet Shampoo + Stain Remover ($12.95/32 oz) is a wonderful product. We have three children and one dog so I struggle to keep our carpets cleaned but I refuse to use those services that use harmful chemicals in the “cleaning” process. 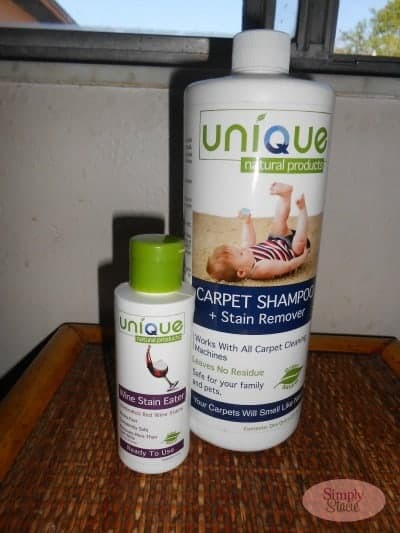 The Carpet Shampoo + Stain Remover from Unique is concentrated and works great for spot cleaning. Not only does it remove the stain but most importantly it removes odors completely. It is safe and so easy to use and I love that the product has very detailed instructions on the bottle for a variety of uses. If you have a pet then I highly recommend considering keeping the Pet Odor and Stain Eliminator handy for those pet related accidents. It would be a great way to safely clean carpet, furniture and even kennels while protecting your beloved pet from harmful cleaning chemicals. It works on all the dreaded pet “issues” that could arise and it works well…thanks for the upset stomach, Jack (our boxer) so I actually had to use this product on his dog bed! I don’t normally use the word “love” loosely to describe a product but I absolutely LOVE this product line from Unique Natural Products. Finally, a natural product line that is both effective and affordably priced! You are invited to visit the Unique Natural Products website to browse the entire product line and shop online for your favorite products. Unique is also carried in 3,000 stores throughout the United States. I would love to try the Septic System Digester. the digest it safe drain opener and/or the septic tank digestive –both would be helpful here! I like the carpet cleaner. I live in a college house with a big dog so we are always using stain removers but I’ve never tried this brand before. Would love to try it! I would love to try the Grime Eater. I would love to try the Super Digest-It Safe Drain Opener. I want to try the carpet shampoo the most followed by the pet odor/stain eliminator. would definitely like to try this my cats pretty much make us now need the carpet shampoo all the time due to the hairballs (gross)! The Unique Complete Odor and Stain Eater.